Just noticed this very attractive title by the Brafman brothers- The book, Sway — the irresistable pull of irrational behavior, “will challenge your every thought”, according to a NY Times review. And it gets similarly good reviews from other prominent people, like Michael Shermer, the author of the recent book The mind of the market, which I blogged about recently. So after this, you get the idea: unconscious, automatic thought patterns act out and cause irrational behaviours, sometimes at the worst possible time and place.The questions raised are, of course, interesting and important. Why do we sometimes make horrific decisions, despite having all the information available to make better ones? Why do prominent people, like George W. Bush, suffer from loss aversion, leading to billions of dollars spent and thousands of lives lost? Because it’s “too late” to pull out? Because the pain of acknowledging defeat, error or insufficiency is bigger than the benefit of sparing yet more money and lives? Other examples can be found at the Wall Street, military, aircraft captains, and even yourself. Maybe even on a daily basis. Taken together, the examples presented in these videos and the book demonstrate that we are all susceptible to make these kinds of errors. The next and better step is, of course, to identify these errors in ourselves (and others) and act upon them in time. Coaching, anyone? My new book, Følelser og kognition (see below), is starting to garner some attention in the Danish press. Tuesday I appeared on the Danish National Radio’s premiere current affairs show, Orientering, to talk about the role of emotions in politics. If you speak Danish you can hear the programme here. First there is an interview with American psychologist Drew Westen who is famous for having conducted an fMRI experiment where, during the 2004 U.S. presidential campaign, republican and democratic voters were presented with contradicting statements about the two candidates, Bush and Kerry. In essence, the results showed that, whereas the subjects had no problem accepting that the opposing candidate would issue conflicting statements, they were loath to accept their own candidate’s statements as contradictory. And this defensive behavior correlated with enhanced neural activity in a number of areas usually thought to subserve emotion processing. 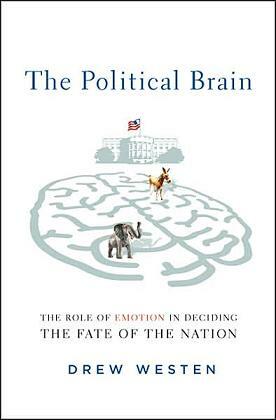 Westen recently published a book called The Political Brain, and most of the interview with him is about this book. Afterwards, the host and I talk more generally about the relation between emotion and cognition in human behavior. Enthusiastic ads motivate individuals to participate (e.g., willingness to volunteer, intention to vote), and once participating, these individuals are likely to become even more committed to their prior preferences. The implication is that enthusiasm leads to political polarization by pushing voters to take action on behalf of their prior convictions. Fear ads have less particiatory power – although to some extent they motivate sophisticated individuals. But, fear can open the gates of persuation, and these ads tend to cause individuals to consider new information and possibly change their political preferences. I cannot see from the review whether or not Brader considers the now vast neurobiological literature on preference formation and decision-making. But it would be an obvious thing for political scientists to do so. In 2003 the journal Political Psychology (Vol 24, Issue 4) attempted such an integration but I am not sure it has had a lot of impact on political science yet. For the rest of us, the main lesson is to turn off the tube when those attack ads come on! Brader, T. (2006): Campaigning for hearts and minds. University of Chicago Press. Druckman, J. (2006): Stroking the voters’ passions. Science 312: 1878-1879. Winkielman, P. & Berridge, K. (2003): Irrational wanting and subrational liking: How rudimentary motivational and affective processes shape preferences and choices. Political Psychology 24: 657-680. Lieberman, M.D., Schreiber, D. & Ochsner, K.N. (2003): Is political cognition like riding a bicycle? How cognitive neuroscience can inform research on political thinking. Political Psychology 24: 681-704. Today's featured article at Wikipedia is about transhumanism, "an international intellectual and cultural movement supporting the use of new sciences and technologies to enhance human physical and cognitiveameliorate what it regards as harsh and unnecessary aspects of the human condition, such as disease and aging." If you think of humanism as the attempt to help every person reach her or his full potential (whatever that means; as if we have an inborn potential), transhumanism goes beyond this and asks whether we can go beyond the "naturally given" potential and expand our possibilities — and reach them. Underlying this idea of the equality of rights is the belief that we all possess a human essence that dwarfs manifest differences in skin color, beauty, and even intelligence. This essence, and the view that individuals therefore have inherent value, is at the heart of political liberalism. But modifying that essence is the core of the transhumanist project. If we start transforming ourselves into something superior, what rights will these enhanced creatures claim, and what rights will they possess when compared to those left behind? If some move ahead, can anyone afford not to follow? These questions are troubling enough within rich, developed societies. Add in the implications for citizens of the worlds poorest countriesfor whom biotechnologys marvels likely will be out of reachand the threat to the idea of equality becomes even more menacing. The enhancements that transhumanists advocate would eliminate this essence. From this, he infers that the transhumanist project would destroy the basis of equal rights. The concept of such a “human essence” is, of course, deeply problematic. Evolutionary biologists note that the human gene pool is in constant flux and talk of our genes as giving rise to an “extended phenotype” that includes not only our bodies but also our artifacts and institutions. Ethologists have over the past couple of decades revealed just how similar we are to our great primate relatives. A thick concept of human essence has arguably become an anachronism. The only defensible way of basing moral status on human essence is by giving “essence” a very broad definition; say as “possessing the capacity for moral agency”. But if we use such an interpretation, then Fukuyama’s third premise fails. The enhancements that transhumanists advocate – longer healthy lifespan, better memory, more control over emotions, etc. – would not deprive people of the capacity for moral agency. If anything, these enhancements would safeguard and expand the reach of moral agency. Fukuyama’s argument against transhumanism is flawed. Nevertheless, he is right to draw attention to the social and political implications of the increasing use of technology to transform human capacities. We will indeed need to worry about the possibility of stigmatization and discrimination, either against or on behalf of technologically enhanced individuals. Social justice is also at stake and we need to ensure that enhancement options are made available as widely and as affordably as possible. This is a primary reason why transhumanist movements have emerged. On a grassroots level, transhumanists are already working to promote the ideas of morphological, cognitive, and procreative freedoms with wide access to enhancement options. Despite the occasional rhetorical overreaches by some of its supporters, transhumanism has a positive and inclusive vision for how we can ethically embrace new technological possibilities to lead lives that are better than well. The discussion about transhumanism is important because it, in its essence, also deals with the part of neuroethics that pertains to brain enhancements. The making and taking of a memory pill; connecting wetware to hardware; and altering genes for non-medical purposes all deal with an aspect of transcending the naturally given about human beings. Of course, so do glasses and contact lenses. But these are mostly tobe seen as tools to help, rater than something that changes you as what you are. Cosmetic neurology (PDF document) is the term for the artificial enhancement of the brain. I'd say that the term is a bit misguided, since in my view, the "cosmetic" sounds too superficial. If you manipulate the brain, you're tinkering with what a person is per se. Taking a "brainy pill", or adding hardware parts to boost your neuronal engine goes beyond the mere tool that glasses and lenses are. There is not much of a "cosmetic feel" about it when you start changing who you are and what defines you as human: error-prone, forgetful, emotional, mortal. So, in a way, maybe we shouldn't be too be worried about the societal aspects about cosmetic neurology (or transhumanistic thought). It is possible that cosmetic neurology is neither the problem nor solution to many of today's world's problems such as poverty and inequality between people. Nor should we think of it as something that will add much to the difference, though it will be something that might mark the difference between poor and whealthy. What we should be concerned about is how technical and medical enhancements will change how people define themselves. Just as so and so many use iPod today, will we see communities of people that start inoperating wireless communication into their brains, as in Peter Hamilton's affinity function in the Night's Dawn triolgy? IOW, we should start thinking about what "brain enhancement" does to the individual rather than staring ourselves blind at the societal problems. According to Darwinian theory, complexity evolves by a stepwise process of elaboration and optimization under natural selection. Biological systems composed of tightly integrated parts seem to challenge this view, because it is not obvious how any element's function can be selected for unless the partners with which it interacts are already present. Here we demonstrate how an integrated molecular system—the specific functional interaction between the steroid hormone aldosterone and its partner the mineralocorticoid receptor—evolved by a stepwise Darwinian process. Using ancestral gene resurrection, we show that, long before the hormone evolved, the receptor's affinity for aldosterone was present as a structural by-product of its partnership with chemically similar, more ancient ligands. Introducing two amino acid changes into the ancestral sequence recapitulates the evolution of present-day receptor specificity. Our results indicate that tight interactions can evolve by molecular exploitation—recruitment of an older molecule, previously constrained for a different role, into a new functional complex. Although these authors have not directly addressed this controversy in the discussion of their work–because the work itself is intrinsically interesting to biologists–such studies solidly refute all parts of the intelligent design argument. Those "alternate" ideas, unlike the hypotheses investigated in these papers, remain thoroughly untested. Consequently, whatever debate remains must be characterized as purely political. Naturally, Behe has been quick to argue that the system Bridgham and colleagues discuss is not really "irreducible complex" in his sense. Is he right? Well, Carl Zimmer checked out what Behe earlier wrote in "Darwin's Black Box" and the definition of "irreducible complex" seems to change according to Behe's whim, so I'll let you all make up your own minds! Bridgham, J. et al. (2006): Evolution of hormone-receptor complexity by molecular exploitation. Science 312: 97-101. Here’s a new field of scientific enquiry: Political Biology, or biopolitics. It sounds strange, doesn’t it? To me, it sounds most like politicians trying to influence how research should be conducted, which areas should be allowable and which should not. But it’s actually the reverse: as this page attests, biopolitics is about how politics could and should be influenced by scientific advances in biology (and, as a consequence, neuroscience). My only – yet substantial – concern is that this approach seems to stop at “biology”, especially evolutionary theory. It most likely includes evolutionary psychology, but even within EP, we rarely if ever see proper discussions about how brain science can inform psychological theories. As this previous note from Martin shows, neuroscience CAN indeed say meaningful things to cognitive and evolutionary psychological theory. So the concern with biopolitics is that it will not include the full range of scientific results in this rapidly developing field. In their classic formulations, valid to this day, the issue of self-preservation is foundational for both political science and economics. In order to fixate this concept, the Modern theorists relied upon various assumptions about human nature. Due to the advances of biology and evolutionary theory, we are today in the position of explicating these assumptions in the form of stable scientific certainties. A foundational concept in biological theory is that of “fitness”. The paper indicates the relationship between the less determined concept of self-preservation and the more rigorous one of fitness. By that, it accomplishes two things: it gives more solidity to the foundation of political theory and political economy, by anchoring them in biology; it opens the path towards a unification between two social sciences and their immediate juxtaposed science, biology. The emphasis of the paper is on political science, aiming to define, on the basis of the above argument, its proper object of study. The notion of fitness extraction is thus defined. A lateral exposition differentiates between political action, thus understood, and economic action, defined more generally as fitness transfer. The distinction is to be eventually furthered in a separate study.